Despite headwinds and turmoil, the solar industry charts another record growth year. A tariff-induced U.S. solar industry assault notwithstanding, there's some good news in solar this week. The International Energy Agency's Photovoltaic Power System Programme's latest report (Snapshot of Global Photovoltaic Markets 2016, PDF) found that 75 gigawatts of solar were installed globally in 2016 -- bringing the installed global photovoltaic capacity to at least 303 gigawatts. That equates to producing 375 billion kilowatt-hours of solar power each year, which represents 1.8 percent of the electricity demand of the planet. The 75 gigawatts added in 2016 was a record. As we've reported, worldwide installed capacity was 51 gigawatts in 2015, up from around 40 gigawatts in the two preceding years. In 2015, there were at least 227 gigawatts of PV cumulatively installed around the world, making up more than 1.2 percent of global electricity demand. Allow GTM to put that into perspective for you. If we rewind to 17 years ago -- the total amount of PV installed in the year 2000 was 170 megawatts. That's megawatts, folks. PV module pricing has made radical progress as well, moving from $300 per watt in 1956, to $50 per watt in the 1970s, to $10 per watt in the 1990s, to $0.40 per watt today. It's not exactly Moore's law, but it's that drop in pricing -- the result of a chicken-or-egg debate between policy and technology -- that's driving this industry. However, that downward cost decline could be reversed by potential import tariff pressure on Chinese solar modules by the Trump administration and its efforts to save Germany's SolarWorld and China's Suniva. The IEA report notes that the market was driven by growth in China, America and India, while Japan and Europe contributed less than in 2015. 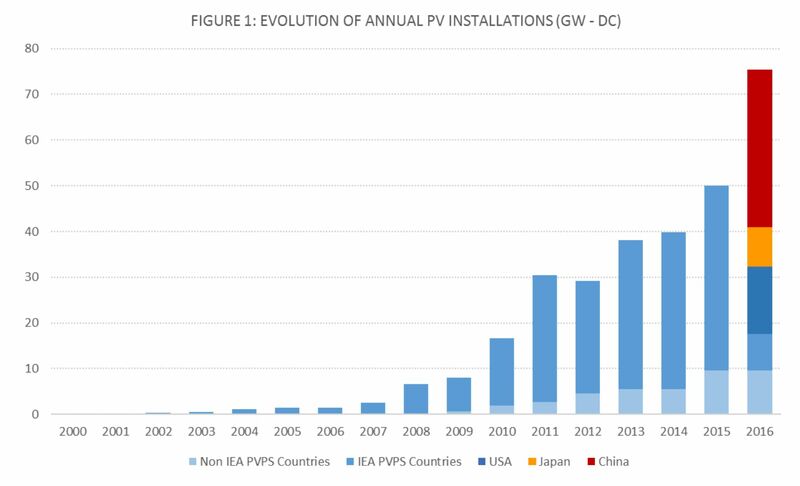 "In other words, the global PV market outside of China grew by 5 gigawatts to 40 gigawatts, while China drove the global numbers up to at least 75 gigawatts." 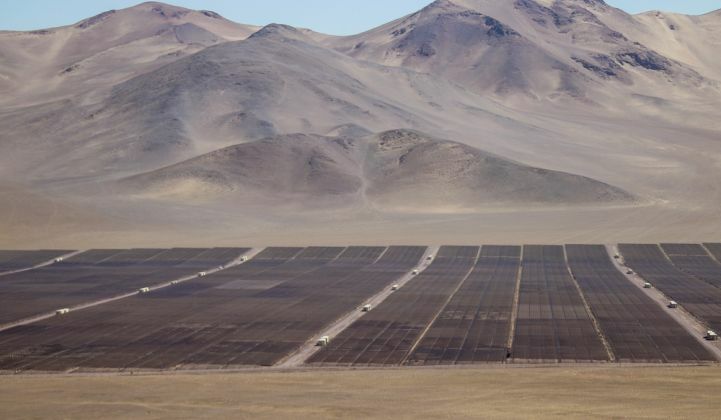 The report concludes, "Once driven by financial incentives in developed countries, PV has started to progress in developing countries, answering to a crucial need for electricity." Still, the new potential tariff on Chinese solar modules could hobble the U.S. solar industry if costs get increased to 2015 levels. The solar industry has coped with setbacks like this in the past. But it might mean that breaching the 1-terawatt threshold of global installed solar will be delayed by a few years.